WHO IS BURIED IN PAKAL'S TOMB? The discovery of the sarcophagus of a great Maya ruler deep within the Temple of Inscriptions at Palenque is one of the great stories of archaeology. Alberto Ruz, director of research at Palenque for Mexico's Instituto Nacional de Antropología e Historia , had long wrestled with an enigma involving the pyramid. No one had been able to explain why a flagstone in the center of the temple's floor had a number of holes drilled in it. Finally Ruz noticed that the walls of the temple continued beneath the floor level, and he suddenly realized that the ancient Maya had sealed off a chamber below. Lowering the final slab into place with ropes through the drill holes, they had sealed the holes with stone plugs. Out of the dim shadows emerged a vision from a fairy tale, a fantastic, ethereal sight from another world. It seemed a huge magic grotto carved out of ice, the walls sparkling and glistening like snow crystals. Delicate festoons of stalactites hung like tassels of a curtain, and the stalagmites on the floor looked like drippings from a great candle. The impression, in fact, was that of an abandoned chapel. Across the walls marched stucco figures in low relief. Then my eyes sought the floor. This was almost entirely filled with a great carved stone slab, in perfect condition. For the first time in more than a thousand years, human eyes beheld the glorious carved sarcophagus lid of a great ruler of Palenque. That the tomb belonged to an important ruler was beyond doubt, considering its magnificence. The entire pyramid of the Temple of Inscriptions had been built around it. But who that ruler might be was a lingering question. Then David Kelley and Floyd Lounsbury analyzed inscriptions from the temple to determine that the occupant of the sarcophagus was named "Shield", or Pakal (originally spelled Pacal, then Hanab-Pakal and now K'inich Janahb' Pakal). Pakal the Great ruled Palenque for most of his 80 years, and it was reasonable to conclude that he had built the Temple of Inscriptions as his own burial monument. But Ruz was disturbed by the fact that the bones in the sarcophagus appeared to belong to a man some forty years younger than Pakal at the time of his death. Preliminary analysis from the bones indicated a middle-aged male, but this analysis was never published for scientists to examine, confirm or reject. A subsequent report in 1971 seemed to confirm the earlier finding based on limited wear on the skeleton's teeth. Meanwhile, epigraphers--scholars who study and interpret inscriptions--had determined definitively the dates of Pakal's birth and his death at an advanced age. "Lord Shield Pacal was by all accounts a most remarkable man," wrote Peter Mathews and Linda Schele in a presentation to the First Palenque Round Table in 1974. "Apparently in power, at least in name, by the age of 12 1/2, he ruled for almost 70 years. His was a dominant influence at Palenque and he was surely the man responsible for its sudden blossoming c. 9.10.0.0.0 into a major Classic site." Mathews and Schele had no doubt that the body found deep beneath the Temple of the Incriptions was that of Pakal. Yet a controversy has raged over the epigraphical findings. It has at times been viewed as a conflict between "scientific" and "non-scientific" research, that is, the methods of anthropologists and forensic scientists versus those of epigraphers. For our part, we have always maintained that the arithmetic involved in analyzing the inscriptional dates of Hanab-Pakal is incontrovertible, whether or not our proposed interpretations of specific events are overturned. To prevent ambiguity, Palenque's scribes tied Hanab-Pakal's birth, accession, and death to the Long Count and to named k'atun-endings that recur only once every 375,000 years. And...they also tied his birth and accession dates to the end of the first piktun, which will occur in A.D. 4772. Thus, if his dates are to be changed, they must move at least 375,000 years into the future. The last argument against the chronology is that in some way the epigraphers do not understand what the Maya intended to say--that, for example, two people are being named as one person, that the history is a fabrication, or that some special way of dealing with time was being used. Concerning these possibilities, I can only say that each of these propositions requires that all of the inscriptional data that use the same calendrics or historical glyphs must be thrown out with the Palenque data, including all knowledge about the Maya and the Mesoamerican calendar in precolumbian, colonial, and modern contexts. This includes the entirety of Tatiana Proskouriakoff's 'historical hypothesis' and all of the histories that have been published for all Maya sites. Schele and Mathews point to a 1996 personal communication from Allen Christenson, a dentist who has worked extensively with the Smithsonian in forensic analysis, that "wear is not a factor in elite dentition as they likely had a diet with more boiled atole which caused little wear." And Norman Hammond and T. Molleson (1994, Mexicon 16 ) are cited to the effect that "people who survive to advanced age in any population naturally have 'young bones' compared to their contemporaries. These survivors do not age as rapidly as other members of the same population, so they might look younger to physical anthropologists assessing their age from skeletal remains." 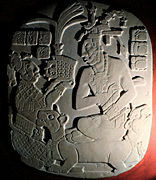 The inescapable conclusion is the fitting one: Pakal the Great is buried in Pakal's tomb.